Jeanne Teleia is a licensed Marriage and Family Therapist specializing in Experiential and Inspirational Retreats with wild dolphins and whales. In addition, Jeanne provides COACHING and COUNSELING for children, adolescents, individuals, family therapy and play therapy. 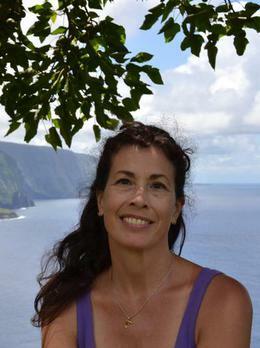 She maintains a private online practice in Hawai'i, Colorado AND WORLDWIDE. Her other interests include her furry friends Violet, Suzie and Smudge and she usually has a menagerie of 4-footed rescue animals including dogs, cats and bunnies. Her best moments are spent in nature swimming with or otherwise interacting with wild and free dolphins and whales. Now she's taking others around the world on retreats to find inspiration and joy through their example. Contact her to find out more! Jeanne has over 25 years experience working with children and families as an advocate, educator and therapist, and is a graduate of the University of Maryland, University of Delaware and the Institute for Family and Play Therapy. Specializing in experiential, play therapy and other expressive and brief therapies, she is currently serving as private practitioner working with a broad spectrum of clients. Among her areas of expertise are trauma, depression, anxiety, ADHD/behavioral/emotional problems, child abuse-past or present, divorce or separation, grief and loss, substance abuse, family violence, stress and anger, post traumatic stress and trauma, self esteem and life, wellness and family coaching. Jeanne is an interactive, solution-focused therapist. Her non-judgemental, compassionate therapeutic approach is to provide support and practical feedback to help clients effectively address personal life challenges. She integrates complementary methodologies and techniques to offer a highly personalized approach tailored to each client. With compassion and understanding, she works with each individual to help them build on their strengths and attain the personal growth they are committed to accomplishing.